I took this photo yesterday with my phone and forgot to post it until I saw it while getting to the Texas one I just posted. 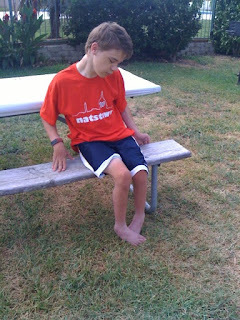 The photo is of Mik at the campsite yesterday morning in Arlington, Texas, wearing his Nats shirt that was part of the things we received at the Nats game. As a Dback fan he was embarrassed Dad put it on him and he wanted it off right away, but I convinced him it is not that obvious of a Nats shirt and probably few in this part of the country will even think it is a baseball team t-shirt. Then this morning he did not want to change out of it until he fully woke up and remembered he was wearing a Nats shirt, so today he is wearing a Dbacks shirt. He will probably not be tricked into wearing it again , but I did get this photo catching him wearing it at least once.